It&#x27;s easy! Just follow these basic, simple tips and you&#x27;ll be well on your way to spectacular feasts. Tomatoes are an easy crop to grow as long as you have a good amount of space, a nice warm sunny spot in your yard and great soil for the tomatoes to grow in. Grow some cherry tomaoes for nice small juicy tomatoes, or even a different type of tomato you have never had like the Green Zebra! You will not be dissappointed by your harvest if you follow some simple directions. Hopefully Mother Nature will be on your side in your growing season! in a spot that receives full sun (min. 6 hrs. a day). near black walnut trees (Juglans nigra) because these trees produce a chemical that wilts tomatoes (as well as potatoes and eggplants). 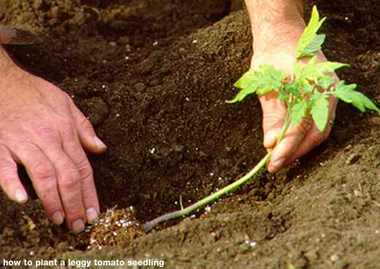 Never mulch tomatoes with bark, wood chips, or hulls from a black walnut tree. To help maintain consistent moisture, mulch around tomato plants and avoid overhead watering or watering in the evening. Moisture consistency also helps prevent blossom end rot. Add a mulch around your plants after they are well established—at about 4 weeks. An Aquapore Hose is another good investment. these can be planted 2½ to 3 feet apart and caged tomatoes should be 30 to 36 inches apart. Remember, tomato plants require good air circulation to stay healthy. Planted too close together, tomatoes can develop blight, fungus, and other diseases. 6 to 8 weeks before the last expected frost in your area. Or, if you want to get a jump on the season, set your plants out a week or two earlier with the protection of a plant protectors. set them in the ground with the stem buried lengthwise in the soil. New roots will develop along the entire length of the buried stem, making your plant stronger and stockier. too much nitrogen will make great, green foliage, but produce little fruit. For best results try Vegetable Food an organic plant food designed especially for vegetables. such as the tomato hornworm- this is a 3- to 4-inch caterpillar who will voraciously munch the leaves of your tomato plants. You can simply remove the caterpillars by hand. types of tomatoes | staking vs. caging | tomato hub! If I build a hoop house around my garden and can keep the temps inside from going below 40 will my tomatoes continue to produce? My brother lives in an apartment complex. He has three tomato plants on his screened in patio. The three plants are about five feet tall, they do flower and then the bud falls off, no little green tomato. They do get plenty of sun and morning water. Should he clip the tops? Help please. It might be the heat that is causing the blooms to drop. I have also read it can be caused by too much or too little nitrogen or humidity, too little water, or plant stress from disease or bugs. When it gets too hot for mine to set, I just keep taking care of them and then when temps go down, the fruit will set. It's can be so frustrating! Good luck to your brother! I have already planted my seedlings. They are very leggy, should I dig them up and bury their stems now? I think I would do that- if they are really leggy and about to fall over, I would dig them up and do the trenching- you can really bury them all the way up to their leaves. Also you might want to give them a feeding of fertilizer for extra nutrients. Trench idea is excellent. <br/> <br/>Any thoughts on how to prevent the late blight that caught us all so badly last year? Other than avoiding buying plants from Big Box stores (which I never do anyway) I am not sure what to do. It hiut Vermont hard, even the organic farmers. So a couple of things you can do- apply a fixed copper fungicide (organic method) to your plants to avoid the problem. Try not to water the foliage of the leaves only at the base of the plant- drip irrigation, or a soaker hose is a great idea. But the most important thing is to truly clean up your yard from last year so as not to infect your plants this year. Thanks for the great info. I will definitely be planting some of my seedlings in a trench like that! Those hornworms are gross. I have had one or two every year and boy can they eat!! Just thinking about pulling them off the plants grosses me out. Sometimes I am able to convince the hubby or the kids to remove them. Blah! !